We’re kicking off this month’s Member Highlight by welcoming our newest Coalition member, Virginia Association for Environmental Education (VAEE). VAEE is a Virginia based non-profit organization comprised of a web of environmental education professionals, working together to advance sustainability and environmental education throughout the Commonwealth. We had the wonderful opportunity to speak with Helen Kuhns, VAEE secretary and advocacy chair to gain insight into their organization. 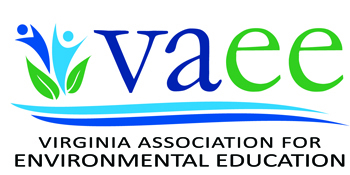 VAEE is the professional organization for environmental educators in Virginia. Our organization represents a professional network of outstanding environmental educators, individuals and supporting organizations who work together to achieve our mission: to support environmental education capacity, professional learning and networking among our membership, as well as advancing Environmental and Sustainability Education in the Commonwealth of Virginia. VAEE offers conferences, trainings and support to regional EE teams and individual members throughout Virginia. 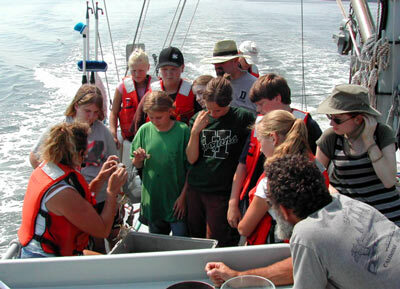 VAEE is the official Virginia affiliate for NAAEE, the North American Association for Environmental Education. Building a strong foundation of environmental literacy. Networking with other Virginia environmental educators. Improving your organization’s programs with new environmental education techniques. Supporting professionalism in the field of environmental education. What issue do you hope to focus on more of in the future? VAEE represents Environmental Educators across the Commonwealth who focus on a variety of issues unique to each region. Whether it is water quality, air quality, carbon emissions, sustainable energy, habitat, ecosystem and watershed preservation and conservation, equity, climate change, sea level rise, or any of the other pressing issues in Virginia, there are EE professionals teaching of needed changes and modeling behavior. There is no environmental issue that does not touch our EE community. Therefore, we wish to focus on those issues that impact our community’s lives regionally and locally towards a healthier environment in Virginia. What are you most excited about joining the Coalition? VAEE is looking forward to the opportunity become part of this network of environmental professionals, to strengthen its messaging and provide the added resources of the VCN community to its members. VAEE looks forward to having a stronger voice through the platform provided by VCN to take a stand on issues that impact our EE community. Iconic rolling working farmland and expansive public forests. World-class rivers and streams. Friendly historic towns and a high quality of life. There is much to protect in Virginia’s Shenandoah Valley. In 2018, four local community organizations joined forces to form Alliance for the Shenandoah Valley to ensure the Valley way of life is sustained by our rural landscapes, clean streams and rivers, and thriving communities for generations to come. The Alliance is led by a talented and engaged volunteer board of directors, with deep community connections throughout the service area, and staffed by the seasoned community leaders who directed each of the legacy groups. And while the legacy organizations have now merged into a single entity, their important work and close community ties endure as part of the Alliance mission – to advocate, educate, and connect people to conserve the natural resources, cultural heritage, and rural character of our region. Our work is so dynamic in nature it’s impossible to pick just one project, so here’s a bit about our current work. County Level Advocacy. We are working closely with county-level Advisory Councils in three of our six counties to improve local land use and transportation planning, increase land protection and water quality measures, safeguard our rural communities, and promote compatible economic development in agriculture and tourism. Supporting Communities That Oppose Gas Pipelines. Dominion Energy’s proposed 42-inch high pressure Atlantic Coast Pipeline continues to threaten Valley landowners and our water resources. The Alliance provides organizational and advocacy support to the local coalition of elected officials, residents, and landowners challenging the destructive and unneeded project. Interstate 81. The Interstate 81 corridor and its future is a cornerstone issue for the Alliance, because it affects farmland, streams and rivers, Civil War battlefields, and the success of local businesses. The Alliance engages the public and lawmakers to seek sensible improvements to Interstate 81 that are compatible with scenic views of the working landscapes and natural resources you enjoy as you travel the corridor. Utility Scale Solar. The Alliance recognizes that scaling up renewable energy can be a significant positive step if properly implemented and can bring economic opportunities for businesses, utilities and landowners. We’ve recently developed a tool to assist localities and communities in consideration of several proposed utility scale solar projects in our area – to ensure projects are appropriately sited, considering designated land use and natural and historic resources. MORE County Level Advocacy. Our on-the-ground relationship with communities in our service area has been pivotal in our success, and we are excited to have expanded capacity to meet and engage communities in the northern part of our service area. Work on the ground. With the headwaters of the James, Potomac, and the Shenandoah arising in the Shenandoah Valley and flowing towards the Chesapeake Bay, water is of great value to our communities. We’ve always advocated for land and water protection, and now we’re ready to get our hands dirty. We’re building collaborations to get more on the ground-- conservation easements to protect working farmland and forests and agricultural practices that improve water quality. We are proud to work with our partner agencies and organizations and their fine track record of engaging landowners and farmers in conservation. Compatible Economic Development. Agriculture. Tourism. The sustained beauty of our landscape and our quality of life depends on those sectors being successful. We are exploring innovative approaches and building connections between farmers and local markets as well as supporting initiatives that will advance tourism, further preserving our landscapes and creating business opportunities in our towns and for communities. The support, encouragement and resources of the Coalition and its members was invaluable as we explored the creation of our organization. Now that we are scaling up, we find confidence in having Coalition members to call on for ideas, examples and best practice as we grow and implement new programs. This month we highlighted Virginia Association for Biological Farming (VABF), our newest addition to the Coalition family. Their community covers a wide range of farmers, gardeners, researchers, students, professionals and supporters of local and sustainable food systems. We spoke with Michael Reilly to learn what VABF is all about. 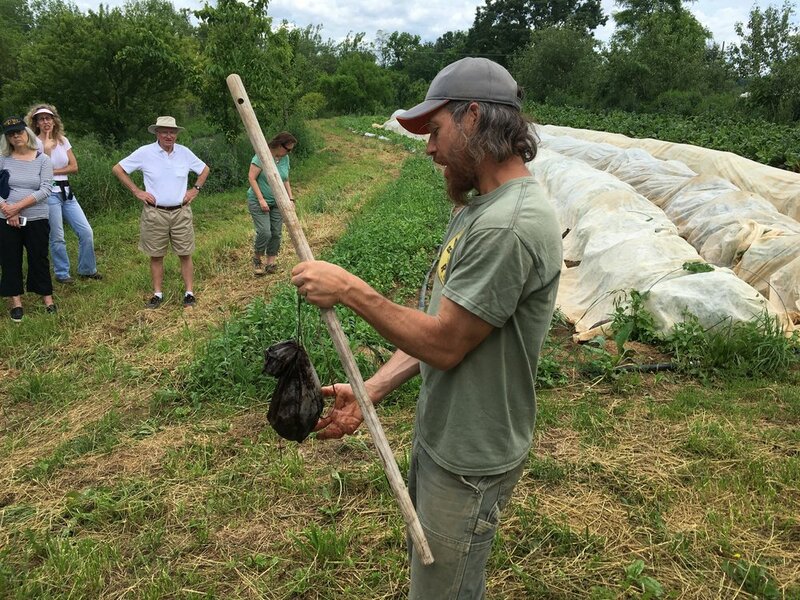 The mission of the Virginia Association for Biological Farming (VABF) is to promote, educate about and advocate for biological and organic farming and food production. Our diverse membership includes farmers, gardeners, seed growers, orchardists, livestock producers, large and small-scale vegetable producers, foodies, grain growers, compost makers and generally those interested in producing high-quality, nutrient-dense foods for their communities. Our members focus on soil health practices and diverse production methods that regenerate the biological systems necessary to feed a healthy plant, animal and human population. VABF is currently working with the Pennsylvania Association for Sustainable Agriculture (PASA) and the Future Harvest Chesapeake Alliance for Sustainable Agriculture (CASA) to develop a regional network of farmers and food producers to provide broader depth in training and mentoring programs and expand the notion of soil health and nutrient-dense foods beyond state borders. The establishment of a Soil Health Collaborative is especially exciting as we connect with partners from within and outside the farm world to provide financial and technical assistance to farmers interested in growing high quality food using regenerative practices and soil health principles. One of the primary goals of VABF is to provide a network for small, diverse family farms to connect for support, training and assistance with biological farming practices, including the marketing of high quality products. Commodity-based agriculture gives little thought to nutritional quality of food products or the environmental impacts those systems have on local communities, and therefore have proven to be unhealthy and unsustainable. We are excited about the resurgence of and focus on local, sustainable and biologically-grown products and their ability to add value to the income stream for small family farms. Our ultimate goal is to build food systems that feed themselves. Using practices that mimic natural systems, biological and organic food production allows for the reduction of off-farm inputs in farming, improving water quality and quantity management, sequestering carbon in our soils and reducing the impact that unnecessary use of fossil fuels in industrial agricultural systems has on our environment. VABF is very excited to be part of the Coalition and trust we can add a valuable agricultural voice to the Coalition’s efforts. As part of this partnership we’d like to help raise more awareness about the dramatic differences between harmful, degenerative, chemical-based industrial agriculture, and beneficial, regenerative, organic, biological farming. Due to the pervasiveness of the former, the latter is usually overlooked, and we hope to foster a more informed dialogue about the realities of different farming practices. Meet Patapsco Heritage Greenway! This organization based in Ellicott City, Maryland, aims to protect, preserve and restore the environment throughout the Patapsco River Valley. We spoke with Hannah Zinnert, who antiquated us more with their mission, projects and goals. Patapsco Heritage Greenway (PHG) is the managing entity of the Patapsco Valley Heritage Area, one of Maryland’s 13 certified Heritage Areas. Our mission is to preserve, protect, interpret and restore the environment, history and culture of the Patapsco River Valley. PHG is at a unique intersection of the local environment, history, heritage, recreation, and tourism. We conduct both environmental and historic resource stewardship. Our environmental program consists of volunteer-based group stewardship events throughout the Patapsco watershed, including stream cleanups, invasive plant removals, tree plantings, tree maintenances, and environmental education events. We also run a Stream Watcher program, in which we train local volunteers to adopt a portion of the Patapsco River or Patapsco tributary by walking, cleaning, monitoring, and reporting on their area. During the upcoming year, Patapsco Heritage Greenway will be working on expanding our outreach, specifically within the Latinx community. Patapsco Valley State Park, portions of which are located within our heritage area boundaries, has a large population of Latinx visitors who use the Patapsco River and its surrounding areas for various reasons. We want our outreach and stewardship efforts to be inclusive of all those who utilize and love the Patapsco River. Thus, we are really excited to be spending this upcoming year working on improving our Latinx outreach through online media, print, and on-the-ground efforts. One of our goals for the future is to improve our water quality monitoring efforts in the Patapsco, specifically to understand the impacts that the quantity and quality of stormwater has on this watershed. Our current monitoring efforts focus on basic physical parameters of the various tributaries in the watershed. In the future, we want to be able to include more robust chemical and biological monitoring on a more consistent basis. With these improved monitoring efforts, we would create a well-rounded watershed report card as both a reference and public outreach tool. We are really excited to be a part of the Choose Clean Water Coalition! We hope to use this Coalition as an opportunity to learn from other groups’ successes (and failures), as an opportunity to crowd-source information and discover new ideas, and to improve our partner network so that we may continue collaborating on future projects in the Chesapeake Bay watershed. All photos courtesy of Patapsco Heritage Greenway. 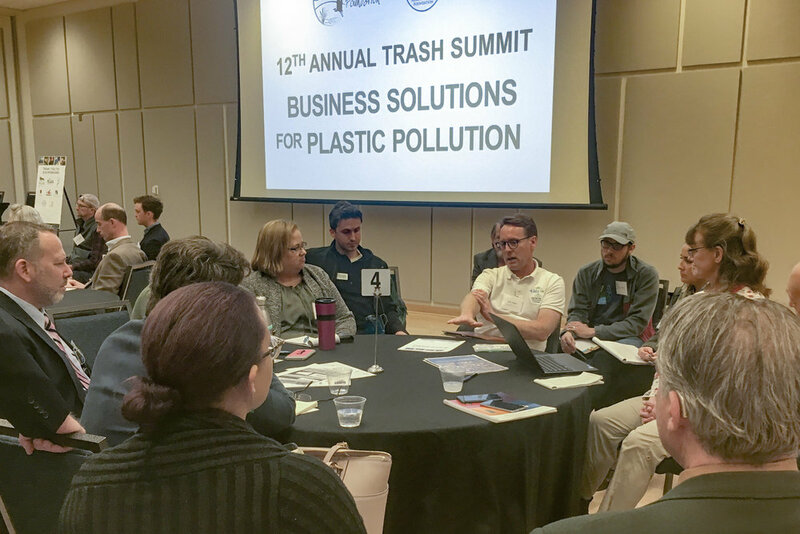 The Alice Ferguson Foundation held their 12th Annual Trash Summit on “Business Solutions for Plastic Pollution,” which united hundreds of community members, business leaders, nonprofit organizations, jurisdiction staff and public officials to discuss corporate entity’s influence on trash pollution prevention. Our host and Coalition member, Alice Ferguson Foundation (AFF), aims to connect and educate youth with Mother Nature, the cultural heritage of their local watershed and teaches sustainable agriculture practices such as regenerative egg implementation. AFF found themselves in the trash business when their students noticed all the washed up trash while walking along the shoreline. From that moment, they set out to clean up the Potomac River and arranged necessary clean ups to remove the litter. 30 years later, AFF will celebrate the 31st anniversary of the Potomac watershed clean up this coming April! The event had TONS of dialogue on solutions to keep our streams, rivers and creeks free of plastic throughout the District of Columbia, Maryland and Virginia, through lively roundtable discussions, informative presentations and knowledgeable speakers. Many speakers shared their concerns, successes and work their organizations are doing to prevent garbage, plastics, and micro-plastics from entering our waterways. My favorite part of the conference was the panel, where key speakers from corporate entities like Busboys and Poets, Farmers Restaurant Group and Marriott International, spoke about how their company has committed to sustainability. Dan Simons, co-owner of Farmers Restaurant Group, talked about the successes and failures the company in D.C. has faced after committing to not serve or sell plastic bottles or bottled water to its customers. Farmers Restaurant Group prides themselves on being mission above profit and have kept millions of waste out of the waste supply chain by refusing to sell plastic straws, and instead opting for paper and hay straws. Andy Shallal, the proprietor of Busboys and Poets, joked about how some of his customers actually believe that they “are too cheap to serve straws.” His main focus is stressing the importance of educating the customer about the companies ‘green’ initiatives and why they are implementing these practices. Denise Naguib, who works for Marriott International, expressed just how huge Marriott’s global footprint truly is. Marriott, composed of 6,900 hotels in 122 countries, began a straw initiative this year to phase out the quarter of a billion stir sticks and straws used by a million and a half of people that come to their hotels every single day. 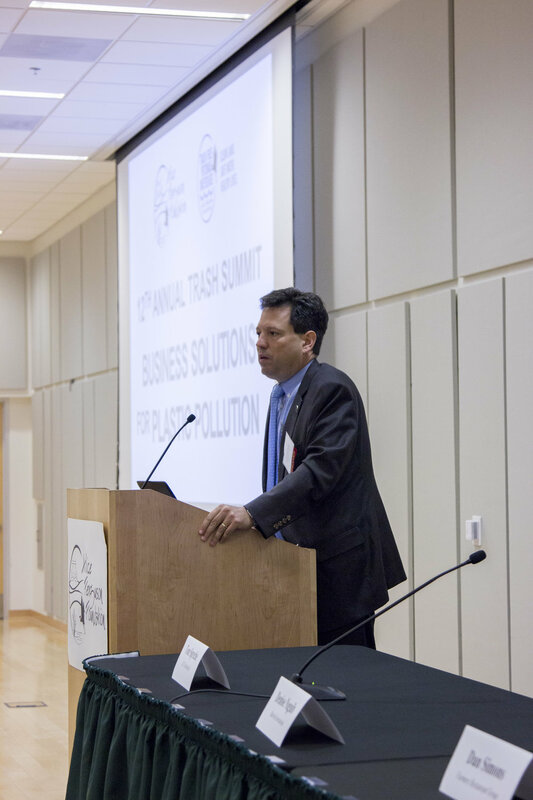 Thomas Sprehe from KCI Technologies Inc., a consulting engineering business, also spoke on the panel regarding their company’s responsiveness to their clients, by giving them solutions to their waste problems by means of science and engineering. KCI is co-responsible for creating the trash wheel that collects floating debris in the Baltimore Inner Harbor, and soon implementing the WasteShark, an aquatic drone that swims through the water collecting floatable plastics and other non-biodegradable materials from urban waterways. In addition to these devices, they also manage landfills and recycling centers. Following the panel, Virginia State Senator Scott Surovell spoke on his work to clean up waterways since being elected. Senator Surovell works tirelessly with constituents, and has organized daunting clean ups for creeks throughout Northern Virginia. At one site upstream of the Potomac, 180 shopping carts were pulled out of local creeks in just one year, in addition to plastics, bags, containers, tractor tires, bottles and guns. He shared how much of a shock this was to him and the surrounding communities. Pollution of creeks and streams are a recurring problem for the state, that they are still trying to solve. However, Senator Surovell has gained a lot of knowledge regarding everything trash, and was even crowned the Shopping Cart Warrior of Mount Vernon, Virginia. He hopes to engage younger generations to volunteer and get active to build awareness and promote civic activism throughout the community. The Summit also gave special recognition to corporate entities that have a commitment to sustainability. One in particular that stood out to me was MGM National Harbor. MGM, taking up a million square feet of space, collects every single bag of trash and sorts them back of house, so that materials that need to be recycled are recycled. Every bit of food waste that MGM accumulates is taken out and placed in their biodigester. I had no idea that a huge company like MGM would be doing this, and hearing about their dedication pleased me tremendously! Last month, the Coalition welcomed Preservation Maryland on board as one of our newest members. They are a nonprofit based in Baltimore, Maryland that is dedicated to preserving all of Maryland’s historical sites through advocacy, funding and outreach. We had the pleasure of speaking with Kimberly Brandt, director of Smart Growth Maryland, to find out more on what makes their organization so special. Advocacy: Speaking up and making the case for the policies, programs and funding that make preservation, open space conservation and community revitalization possible. Outreach & Education: Working to support and empower preservation efforts statewide through coordination, training and direct engagement via our Six-to-Fix program. Funding: Directly investing in preservation projects through our Heritage Grant Fund, property redevelopment efforts and by working to secure additional private philanthropy in our state’s historic resources. Preservation Maryland is excited about the new Smart Growth Maryland program, which will continue and build upon the work of 1000 Friends of Maryland. The 1000 Friends Board of Directors elected to consolidate with Preservation Maryland earlier this year. Preservation Maryland was one of the founding organizational members of 1000 Friends of Maryland in 1994 and has been a partner through the years by advocating for the policies and programs that make redevelopment of historic communities and protection of open space a reality. Preservationists have long made the argument that revitalization of existing communities – and their historic places – is smart growth. When existing communities are revitalized, sprawl development is limited. This symbiotic relationship has kept the smart growth and historic preservation communities advocating on each other’s behalf for many years. The launch of Smart Growth Maryland further solidifies this already strong relationship. Many Maryland cities and towns are struggling while forests and farms are lost to new, car- dependent developments. While minimizing the loss of rural land to development continues to be a priority, Smart Growth Maryland will also increase the focus on investment in established communities. Making it easier for developers to do the right thing remains a challenge that must be addressed. The consolidation of 1000 Friends of Maryland with Preservation Maryland – and the creation of Smart Growth Maryland – presents an exciting opportunity to work with our preservation, transportation and environmental protection partners to grow smarter in Maryland. Many coalition members have long been partners of 1000 Friends of Maryland. We are excited to be continuing these partnerships under the banner of Smart Growth Maryland and to be working to improve the quality of life in our cities and towns, expand transportation choices and protect and maintain Maryland’s natural areas and open spaces. Last month, the Coalition had the pleasure of welcoming our first international member, Namati. Based out of Washington, D.C., Namati is a nonprofit organization committed to placing the law in the hands of the people. Namati situates grassroots legal advocates, also known as “community paralegals,” that work to protect citizens from multiple issues. These challenges span from preserving community land, citizen’s rights and health to exposing environmental injustice. They promote learning and collaboration with practitioners in grassroots organizations worldwide and work to advocate for policies and reforms. We spoke to Alayna Chuney, Environmental Justice Consultant for Namati, to learn more about their purpose. Namati is a Sanskrit word that means “to shape something into a curve”. Martin Luther King Jr. said that “the arc of the moral universe is long, but it bends towards justice”. We call ourselves Namati because we’re dedicated to bending that curve. Namati is a global organization dedicated to legal empowerment. We focus on “community paralegals”, sometimes called barefoot lawyers or legal empowerment advocates, who demystify law and help people exercise their rights. Namati works with community paralegals in 8 countries and hosts the Global Legal Empowerment Network, made up of over 1500 groups from 130 countries. Our mission is to build a global movement of grassroots legal advocates who give people the power to understand, use, and shape the law. These advocates form a dynamic, creative frontline that can squeeze justice out of even broken systems. This is Namati’s first attempt to support grassroots legal empowerment in the U.S. We have a huge respect for the environmental justice movement here, and we look forward to working with community activists and organizations that are passionate about the environmental justice movement. Namati seeks innovative ways to develop and manage environmental regulation so that they achieve better environmental compliance. We experiment with interventions at the policy level and with institutions and communities. Our program will focus on environmental justice communities in Maryland and D.C and our goal is to create a case mapping system that will allow organizations to effectively track environmental injustices and figure out the legal tools necessary to redress the issue. Namati hopes to focus on environmental issues that impact low-income and minority communities. Our main focus right now is clean water and clean air, but we are realizing that safe housing and lead is a big issue in environmental justice communities and may be something in the future that we look at. Namati hopes to gain lasting relationships with members of the Coalition. There are a ton of resources that the Coalition provides and we would like to use those resources to help us fulfill our mission of fighting environmental injustices. Being a part of the coalition will also allow us to partner with like-minded organizations and to learn about important issues surrounding clean water. This month, the Coalition welcomed new member The Chesapeake Bay Environmental Center (CBEC), a Maryland-based organization that promotes restoration, education, conservation, and overall stewardship of the Chesapeake Bay Region. With tons of activities for the public, they hope to connect with you. We spoke to Courtney Leigh, director of communications and strategic initiatives, to learn more about the programs and mission of CBEC. Tell us a little about your organization and mission. Over 600 species of birds call CBEC home throughout the year! The Wildfowl Trust of North America Inc. was founded in 1979, with the intent to protect wetlands for waterfowl while maintaining captive waterfowl collections for educational purposes. In 1981, the Trust purchased a 315-acre farm tract in Grasonville, Maryland on which it initially established Horsehead Wetlands Center and opened to the public in 1985. In 1998, the Trust purchased an additional 195 acres and placed the now 510-acre preserve under conservation easement. In 2002, the Trust revamped its mission to address the issues of declining water quality, urban sprawl and habitat loss and set a goal to be recognized as a leader in environmental education and bay restoration. The site was renamed the Chesapeake Bay Environmental Center to reflect the new focus of the mission. The mission of the Chesapeake Bay Environmental Center is to promote stewardship and sustainability through environmental education and habitat restoration. Take a guided kayak tour! I am thrilled that CBEC is expanding our Kayak Programs. CBEC believes that accessibility to the waters of the Bay will increase appreciation, knowledge, and stewardship of the Chesapeake Bay Ecosystem. For this reason, CBEC is hosting six ACA Instruction Programs for Kayak Paddling Skills and Assessments in the spring and summer to ensure paddlers have the opportunity to hone paddling technique and learn safety and rescue strategies. I love facilitating this program by developing the instruction courses, promoting the courses, and teaching the instruction courses. 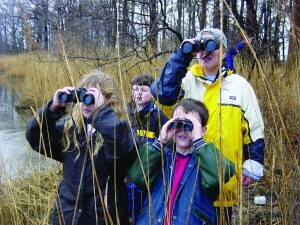 Become a Maryland Master Naturalist! In my new role at CBEC as Director of Communications and Strategic Initiatives, I hope to focus on engaging more donors to our contribution base that will allow CBEC to effectively serve as the premier environmental education organization in the Bay watershed and maintain our property as crucial habitat for the wildlife of the watershed, while also offering visitors a chance to eco-recreate! By being a member of the Coalition, I hope to be able to connect with other organizations to find symbiotic partnerships. I also hope to be able to contribute to initiatives on topics of equity and communications. We had the opportunity to speak to Frank Rodger of Cacapon Institute to learn what makes this organization so wonderful. Not only were they awarded the Arbor Day Foundation’s Headwaters Award, but their continued work in educating the community and youth has made a big difference in their local West Virginia communities. Tell us about Cacapon Institute, what makes you all unique, and your mission. Since 1985, from the Cacapon River, to the Potomac, to the Chesapeake Bay, Cacapon Institute has protected rivers and watersheds using science and education. The Institute is unique because we focus on hands-on education that engages youth and adults in real-world watershed conservation Best Management Practices (BMPs). BMPs include tree plantings, and installing rain gardens and rain cistern. BMPs reduce non-point source stormwater runoff pollution at the source, before it can reach local streams. We are a certified West Virginia Department of Environmental Protection laboratory. We do water testing regularly and, like many groups, we teach the importance of watershed protection. What makes us unique is that, in addition to the instruction, we provide technical and material support so students, watershed associations, and civic organizations can engage directly in watershed protection and restoration. Cacapon Institute has three hands-on BMP programs. PHLOW, Potomac Headwaters Leaders of Watershed, began in 2008 teaching “Watershed 101” to students and engaging them in BMP projects at their schools. Thousands of students have learned the causes of stormwater runoff pollution, solutions to pollutions, and been personally engaged in mitigating runoff pollution. Students are learning by doing and leading by example to protect rivers and watershed suing science and education. Cacapon Institute inherited Carla Hardy West Virginia Project CommuniTree in 2011 and we have grown “CTree” into West Virginia’s largest volunteer tree steward program for planting on public lands. We have provided technical and material resources, including more than five-thousand no-cost trees to our volunteers across the eight counties of West Virginia’s Potomac Basin. The Institute is the “urban forestry” lead for the West Virginia Chesapeake Bay Program. Urban forests are the trees we live with, the trees that grace our towns, parks, schools, neighborhoods, and roadsides. Cacapon Institute’s newest program “Your Community BMP” is engaging private landowners in tree planting and BMPs. 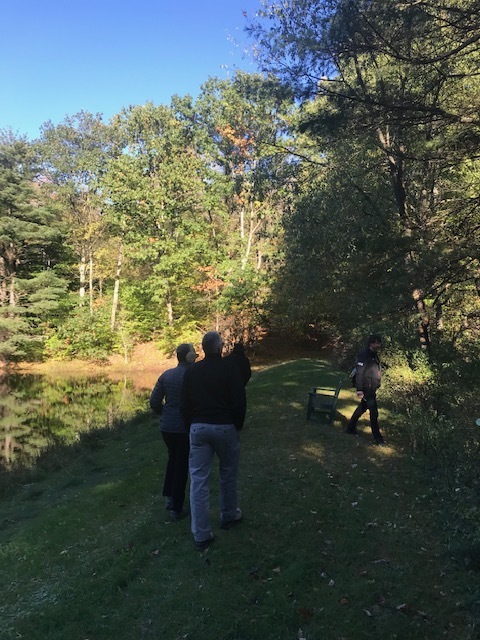 The Institute provides planning assistance, education, and material assistance to private homeowners and businesses to help them reduce their “footprint” and better manage their property to have a positive impact to protect local streams, the Potomac, and the Chesapeake Bay. Private landowners in turn contribute financially and invest their time and energy to make their properties more Bay friendly. Cacapon Institute’s unique blend of arboriculture, conservation BMPs, education, and science combines to engage youth and adults across all walks of life and backgrounds from the Shenandoah Valley, through West Virginia, and into Western Maryland. We believe that, with education and the requisite technical and material support, private citizens can have the greatest positive impact to protect and restore local waters, the Potomac, and Chesapeake Bay. What does receiving the Headwaters Award mean to you all? In all our years, the most heartfelt recognition Cacapon Institute has received came from Finley’s Green Leap Forward. Elizabeth Finley Broaddus, an 18 year-old student at Highland School with plans to attend the College of William and Mary received the terrible news that she had a rare form of terminal cancer, Cholangiocarcinoma. As she battled the incurable disease, Miss Broaddus set up Finley’s Green Leap Forward to “support local and global efforts that have a positive impact on the environment, moving us forward towards a healthy, sustainable planet.” Shortly before passing, for Earth Day 2014, Miss Broaddus selected her first two “Green Leap” grantees, Cacapon Institute in West Virginia and The Green Belt Movement in Nairobi, Kenya. Every day, we draw strength and inspiration from this heartwarming recognition from a powerful young lady. What issue area do you hope to focus on more of in the future (500 words or less)? We will continue to protect rivers and watershed using science and education. We will to expand Carla Hardy West Virginia Project CommuniTree to reach ever more communities and organizations. Your Community BMP will engage more individuals and strengthen community organizations interested in environmental protection. Hands-on engagement is the best way to teach the science of watershed protection and educate the public on the importance of personal action to protect the environment. PHLOW has been teaching school students, at the classroom level, since 2008. Going forward we want to see Meaningful Watershed Educational Experiences become systemic in West Virginia’s Potomac Basin. As we continue to work with individual teachers and classrooms, we will reach further to engage entire schools and, eventually, we will engage county school boards to make environmental education part of regular curriculum. Moving environmental education into the mainstream of county programing will ensure all our youth are engaged and learn the value of river and watershed protection. For more information on Cacapon Institute, contact Frank Rodger. Middle Susquehanna Riverkeeper is a well-known group to those of us in the Bay watershed. Championing clean water for the Mid-Susquehanna area, they pioneer education programs of many kinds - including the education of their "Little Keeper" sewage sniffing puppy Sussey. We spoke to Carol Parenzan, riverkeeper, to learn more about the organizations work and how her one woman team is changing the Susquehanna. Middle Susquehanna RIVERKEEPER® is the WATERKEEPER® Alliance-licensed voice advocating for clean water in the headwaters section of the Susquehanna River watershed, defined by the North and West Branches of the Susquehanna River, an approximate 11,000 square-mile area in North-central Pennsylvania. Tell us a little about your work with Loyalsock Creek and what it took to help make it Pennsylvania’s River of the Year? The Loyalsock Creek is a 64-mile-long treasure in a sparsely populated mountainous section of the Susquehanna River watershed, flowing southerly to the West Branch Susquehanna River. With the recognition of Pennsylvania’s 2018 River of the Year, this local legend will now receive state-wide focus, drawing visitors to the watershed for recreation while advancing economic development for the residents and businesses in the area. To receive this honor, Pennsylvania Department of Conservation and Natural Resources (DCNR), in partnership with Pennsylvania Organization of Watersheds and Rivers (POWR), solicited nominations from organizations around the state in support of select watersheds. Middle Susquehanna RIVERKEEPER® Association, Inc., in partnership with Loyalsock Creek Watershed Association, submitted an application for Loyalsock Creek. From many nominations, five waterways were selected, including Loyalsock Creek. For about four weeks, the public was invited to cast one vote per email address for their favorite waterway (river, stream, creek, lake). 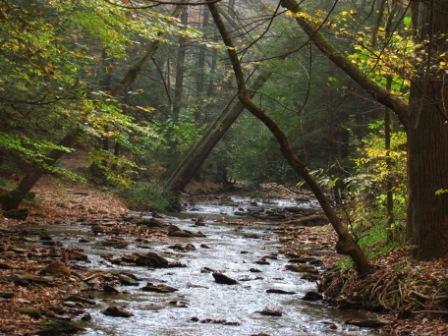 At the end of the voting period, Loyalsock Creek surged ahead, surpassing the other nominees from more populated areas of the state, and was formally recognized as the River of the Year. This popularity contest for River of the Year has not been the creek’s only “challenge.” Logging stripped the mountains of its native natural resources, and its headwaters were impacted by coal-mining activity and now receive treatment for abandoned mine drainage (AMD) issues. The watershed sits in the heart of the Marcellus play and the area is home to active natural gas development including wells, access roads, and pipelines. In October 2016, an extreme weather event contributed to the rupture of a c.1937 gasoline pipeline, releasing an operator estimate of 50,000 gallons into the exceptional value trout stream, and causing wide-spread bank erosion and stabilization issues and road and bridge closures. And, in 2017, a 60,000-gallon flowback spill off an active natural gas well pad found its way into a tributary of the Loyalsock. But the positives outweigh the negatives, as the Loyalsock Creek is home to the rare hellbender, one of the state’s most popular state parks – Worlds End State Park, the 60-mile Loyalsock Trail (and its breathtaking vistas), premier bird-watching spots, and historic covered bridges. For me as the Middle Susquehanna RIVERKEEPER®, it is that go-to spot when I need to regroup and re-energize. It reminds me of why I do the work I do. With this 2018 recognition, Middle Susquehanna RIVERKEEPER® will work to create opportunities for community members to connect with the creek. In addition to a paddling adventure, other programs include a music and arts festival, a family science day along the creek, small business spotlights, a floating classroom, a wellness workshop, educational walks and talks, a historic covered bridges tour, an artist residency with elementary school students, a youth fishing day, and even river snorkeling to take a peek beneath the surface. The overall goal is to then transfer this local recognition and watershed appreciation to the larger geographic region that defines the work of Middle Susquehanna RIVERKEEPER®. 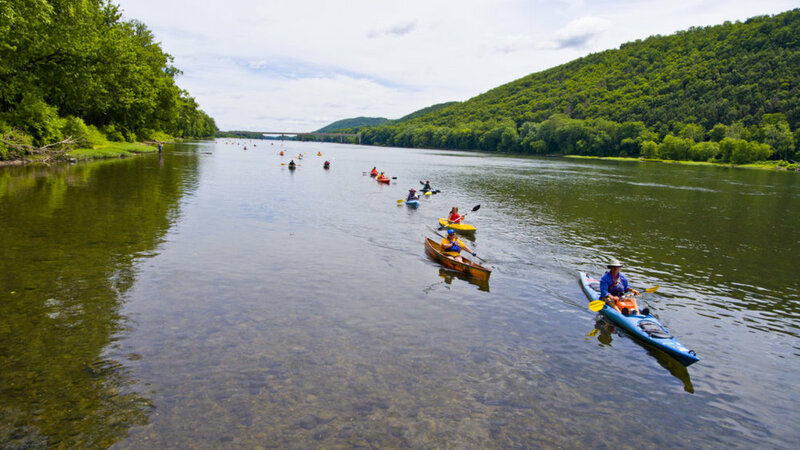 We all deserve swimmable, drinkable, fishable waters in Pennsylvania, on the Loyalsock Creek and throughout the watershed of the Mighty Susquehanna River. One of our current focus areas is environmental justice, working with communities that have been historically underserved, such as the coal-mining communities. First, Shamokin, an economically depressed but once prosperous city in the watershed, is my family’s home – but not where I was born or raised – that was in the “Willy Wonka World” of Hershey (Pennsylvania). My family moved from Shamokin to Hershey before I was born but family took me back to Shamokin on a regular and consistent basis. As a child growing up witnessing these two geographic and economic extremes , it was difficult to understand why the Shamokin area creeks ran red, the coal-waste mountains were high and black and supported little life, and my cousins living in Shamokin had vastly different opportunities than I did in Hershey. This realization is what pushed me down the path of environmental engineering. I wanted to build a change. I believe that everyone deserves to be an active player in creating this change, including our prison population. Last summer we launched our Environmental Steward Prison Pilot Project, where for one week, I was in residency with six inmates in a remote section of the watershed. They were my partners for the week. And although I shared my knowledge with them about water quality, macroinvertebrates, and community leadership in environmental stewardship, they taught me – about the fear of water and the darkness of the woods, about not being heard or recognized, and about the will to be the difference. Two of the six “residents” had never placed their toes in freshwater. The concept was foreign to them. By the end of the week, they were relaxing on boulders in the river, writing in their nature journals, exploring environmental career options upon their imminent release, and preparing to head home to be community leaders and protect their precious water resources. We will be returning in August for another week of partnership. We are also exploring hosting a green jobs fair for all of 500 prisoners at this facility. The world needs them, and they need to be a critical component of our environmental movement. It’s a global second chance. Our work also focuses on engaging our youth that reside in underserved communities throughout the watershed. We work with them through schools, summer camps, and youth organizations, looking for opportunities to give them experiences, such as kayaking, fishing, and environmental exploration, that they may not have otherwise. Last summer, for example, using the flume lab at Bucknell University, we worked with underserved youth to create a whitewater kayak course and then transferred that experiential knowledge to our own river and witnessed the impact of local bridge construction. Through a scholarship program, we will be taking a contingency of teenagers on our River of the Year paddle. We are looking forward to this day on the water with them. Now that you have been appointed to the State’s Environmental Justice Advisory Board (EJAB), how will the work you do change? What new role will you be playing in local environmental work? First, we are not Philadelphia. We are not Pittsburgh. We are an area that includes a significant poor, working white population. We are not the typical face of environmental justice, and that brings about its own set of challenges as our struggles are not always acknowledged. We’re working to change that. But, my role for the present is that of a student. I have much to learn about the history of the Pennsylvania Environmental Justice movement and the Board’s vision for its future. The Advisory Board meets in person four times a year. I have now attended two of these meetings and have walked away inspired and energized. My colleagues are my teachers. I welcome their instruction. And I am depending on their guidance. Photo of Sussey, the "Little Keeper"
As a member of EJAB, it is not my role to be the voice of my communities but to assist them in finding their voices. For now, I am uncovering those potential voices and partnering with them to share the message and engage in change. At this location, we encourage community members to visit with us. We have created a resource library and we host nature book club gatherings there as another open door. (Our first book was The Riverkeepers by John Cronin and Robert Kennedy Jr., the leader of the Waterkeeper movement.) This location also allows me (and my conservation canine “Little Keeper” Susquehanna, who is being trained to detect sewage leaks in the watershed) to take walks along the river throughout the day and engage in conversations with community residents and business leaders. Wonderful words are exchanged when gazing at the water. But being in Sunbury in the heart of historically disproportionate opportunity also provides us the entry to engage in conversations about economic development and entrepreneurship. Part of my background includes entrepreneurial consulting and teaching business development skills through a global consortium of over 2,700 colleges and universities. I want to bring this knowledge home to our watershed and work with residents to create businesses that will support growth up and down the river. We also want to extend this entrepreneurial movement to the prisons. We are in the beginning stages of developing an eco-preneurship program for prisoners to offer “green” business planning guidance and mentorship. There is nothing stronger than partnership and collaboration. As water warriors, our collective words are more persuasive, our actions more noticeable, and our energy amplified. Together, we give voice to clean water and the Chesapeake Bay. As an organization of one person, I rely on the strength of many, especially my Coalition colleagues. I could not begin to do this work on my own – from your providing legislative updates and lobbying opportunities, crafting letters of support, partnering for legal guidance, offering ongoing professional education and updates, and more. Did I mention encouragement? Yes, encouragement. Thank you for your encouragement! I regret that I can’t be more active with the many programs spearheaded by the Coalition. It is difficult at times to be on conference calls (especially when I’m in a mountainous non-cell-service area) or to attend in-person gatherings in the Bay area due to the distance. But I think of you often and read the minutes and reports as they appear in my inbox. As I grow more comfortable in my role as the Middle Susquehanna RIVERKEEPER® and as a member of the CCWC, I hope to mentor the next new water warrior in the group. We all live both upstream and downstream, and this includes the flow of knowledge. And I do look forward to my time with all of the CCWC members, and I’ll be welcoming “you-ins” (that’s coal-cracker talk) to Pennsylvania in May for the annual conference. We’ll know if you’re native or not by the way you pronounce Lancaster or how you respond when we ask you to “outen the lights.” Till then, thank you! Safe travels to Pennsylvania. Mary Katherine Sullivan is an intern at Choose Clean Water. This week we are pleased to highlight Baltimore Tree Trust - an urban forestry group located in one of the most metropolitan parts of Maryland. We spoke to Sheila McMenamin, director of programs at Baltimore Tree Trust, to learn more about what their goals are and how they intend to make Baltimore a greener city. The Baltimore Tree Trust (BTT) is a 501(c)(3) nonprofit organization founded in 2009 to make Baltimore a greener and healthier place to live. Our mission is to restore Baltimore’s urban forest through increased tree planting, community engagement, and advocacy. Since our inception, BTT has planted over 4,000 trees on private property and in disadvantaged neighborhoods throughout Baltimore City. The Tree Trust spearheads efforts to achieve Baltimore’s 40 percent urban tree canopy goal by methodically planting up neighborhoods that have few existing trees, while engaging community leaders and stakeholders in the planting and sustainable maintenance of trees. We are really excited to be kicking off our pilot workforce development program in the fall of 2018, called the Urban Roots Apprenticeship. This full-time, 6-week program will focus on developing our city’s green workforce--individuals who plant and maintain Baltimore’s tree canopy. The tree care industry is a growing workforce, and there are ample companies looking for skilled workers. We are excited to train individuals in a way that properly prepares them for a career in this industry. We are interested in getting more involved with local policy and urban planning, and seeing where we can be stronger advocates for tree planting and maintenance. If we can incorporate tree planting into early-stage planning for urban development projects, we can ensure that all neighborhoods have access to the countless benefits of a tree canopy. We are eager to be involved with a network of organizations and individuals who are passionate about our environment, but more so, how to bring that passion to all. There are so many potential ways in which we can intersect and support each other’s work, and we are excited to see what those possibilities are. One of the joys of being a coalition of over 230 members is the opportunity to see how our collective mission can be shared among a diverse set of organizations. One may not immediately guess that the Civil War Trust would be a member of the Coalition, but their work towards land preservation and safeguarding green spaces makes them a perfect fit. We spoke to Paul Coussan of the D.C. organization to get a better idea of how The Civil War Trust and the Choose Clean Water Coalition may have more in common than one might think. Photo courtesy of the Civil War Trust. The Civil War Trust is a nonpartisan, nonprofit organization devoted to the preservation of America’s hallowed battlegrounds. Although primarily focused on the protection of Civil War battlefields, the Trust also seeks to save the battlefields connected to the Revolutionary War and War of 1812. Through educational programs and heritage tourism initiatives, the Trust seeks to inform the public about the vital role these battlefields played in determining the course of our nation’s history. To date, the Trust has saved more than 47,000 acres of core battlefield in 25 states, including thousands of acres within the Chesapeake Bay Watershed – at Gettysburg, Fredericksburg, Malvern Hill, Appomattox, Antietam, Monocacy, Cold Harbor and Manassas to name just a few. The Trust has long been at the forefront of creating online educational resources for the study of Civil War, Revolutionary War and War of 1812 battlefields. We are constantly rolling out new resources – animated battle maps, battle apps for smart phones, videos and web content – to aid heritage tourists, educators and students about these wars. We also continue to preserve key battlefields from the first century of our nation’s history, at Revolutionary War sites throughout the Southern Campaign, at War of 1812 battlefields in New York, and in Civil War Battlefields throughout the Chesapeake Bay watershed, from Manassas, to Monocacy. Additionally, the Trust is working with the Culpepper, Virginia, community and the Commonwealth’s General Assembly to create a Brandy Station and Cedar Mountain State Park. In addition to interpretive trails and other outdoor activities, we hope to include kayaking along the Rappahannock River as a key recreational component of the park. While the Trust remains laser focused on our mission to preserve Civil War, War of 1812 and Revolutionary War Battlefields, we focus a great deal of our efforts on education and interpretation. We are constantly creating new platforms to educate about these wars and how they shaped and continue to shape the nation we are today. Through our new Generations programs, the Trust encourages families to visit battlefields together, and for adults to bring their children and grandchildren to explore a battlefield together. The Trust is also exploring new ways to market these battlefields to encourage visitors young and old to explore these sites. America’s battlefields - when properly preserved, interpreted, and promoted — provide unparalleled opportunities to inspire new generations of American citizens. We are engaged in finding new ways to inspire more Americans to connect with, learn from, and experience firsthand the authentic places where history happened. The Trust has a long history of working with partner groups across the spectrum, from historic preservation groups like the National Trust for Historic Preservation, to land groups like the Trust for Public Lands, to clean water groups like the Choose Clean Water Coalition. Through these partnerships, the Trust is able to help identify ways in which these organizations can work together to achieve similar goals – preserving our history, safeguarding our green spaces, protecting our environment. In its efforts to preserve historic open space for use as outdoor classrooms, the Trust seeks to build partnerships across the spectrum to preserve the open spaces where Americans fought and died to make the nation we are today, while ensuring these sites are accessible and open to the public to give everyone an opportunity to explore these outdoor classrooms. For more information about the Civil War Trust, contact Paul Coussan. 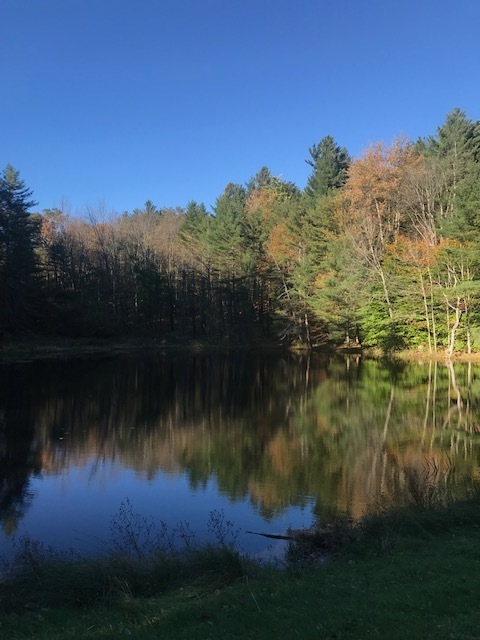 Our most recent member highlight goes to Lancaster County Conservancy (LCC), a Pennsylvania based group working towards cleaner water in the Lancaster region. With over 2,600 members, they work hard to ensure and secure a healthier future for the environment of Pennsylvania.The Conservancy is governed by an 18 person board of directors who have responsibility for the direction of the LCC, all chosen by the community. We spoke to Fritz Schroeder about what makes this organization so important and why they need your support. The Lancaster County Conservancy’s mission is Saving Nature – Providing wild and forested lands and clean waterways for our community. The Conservancy was founded as a land trust in 1969 by local hunters and fisherman who were concerned about the loss of natural lands. Today the Conservancy owns over 5,000 acres, 40+ miles of trails, and 35+ miles of streams. In addition to land protection we have three departments that focus on: stewardship to ensure ecological function, management and care of the 5,000+ acres, education to instill a passion for nature that ensures the ongoing care of our wild lands for generations to come and Urban Greening, which focuses specifically on clean water infrastructure issues urban and suburban areas of Lancaster County. Lancaster Water Week presented by the Lancaster Conservancy is entering its 2nd year, June 1 – 9, 2018. This event focuses in on the way water connects us all - celebrating the unique waterways of Lancaster County, educating the public about the challenges we face and opportunities we can create, and activating people to get involved in their watershed community. We also have First Friday in Downtown Lancaster, which is the official kick off to Lancaster Water Week. This event celebrates art in the community, connecting local culture with local environmental issues. We hope to continue our preservation of protected areas, while strengthening community involvement. Our Urban Greening Program and Best Management Practice education require continuous effort and growth to make a difference, and we look forward to expanding this into a greener Lancaster. The Lancaster County Conservancy is also expanding its outreach in 2018 to target a family and millennial audience. The conference has been invaluable in growing our knowledge about Bay wide issues and we’ve met many wonderful professionals. We are more than excited to be hosting the conference once again here in the City of Lancaster in 2018 and can’t wait to share our community with new and old friends. For more info, contact Fritz Schroeder, director of urban greening.